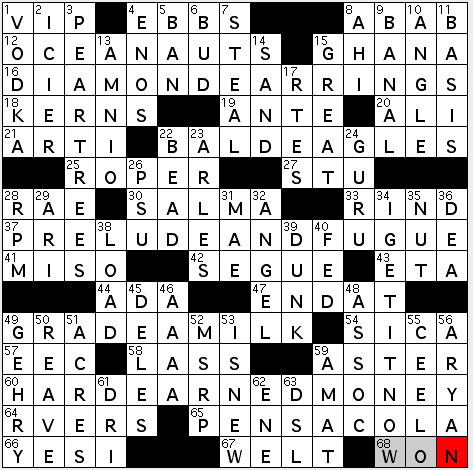 This year’s constructors for the American Crossword Puzzle Tournament were announced today. Six men, two women, all talented. The tournament is April 1-3. I might even show up. You never know. The Indie 500 tournament takes place in Washington, DC on June 4. They’re announcing another constructor each day this week, culminating with the presentation of the contest-winning final constructor. ALPHABETIZATION is the name of the game, and it’s clued 64a. [One way of ordering things, like all the consonants in rows three, six and nine]. I’ve circled those consonants, and they do indeed include all 21 consonants in alpha order. There’s really nothing else interesting in the theme—just a series of short words that happen to have certain consonants in a certain order. Makes for a rather ho-hum solve. 26a. [___ bear], KOALA. Yes, we know the koala’s a marsupial and not a bear. Simmer down. It’s just a colloquialism. 49a. [They’re never away], HOME GAMES. See that OMEGA lurking within, following the thematic WaX and YaZ? I wonder if Don and Zhouqin are playing with us. 3.5 stars from me. Good night, and good luck. Lemme say this from the start: this was a very, very mixed solve for me. Theme? Theme execution? A-1. Simply terrific. Quality of longer fill? “GREAT!” Cluing? 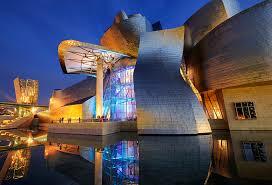 Rarely BANAL; more to the point, almost always fill-enriching, sometimes fill-saving. So what’s the problem? Far too much short fill that’s “more functional than fun”—and for me, alas, in a genuinely dispiriting way—in the “false rhyme in an otherwise beautifully crafted song” way. Deflating. Your mileage may vary!! 16A. DIAMOND EARRINGS [Sparkling gifts from Tiffany & Co.]. The way this fill crosses the delightful (non-partridge-bearing) PEAR TREES, brought to mind two lines from the Leo Robin/Jule Styne song “Diamonds are a Girl’s Best Friend”: “But square cut or PEAR shape / These rocks don’t lose their shape! / Diamonds are a girl’s best friend,” and also “But stiff back or stiff knees, / You stand straight at Tiff’ny’s! 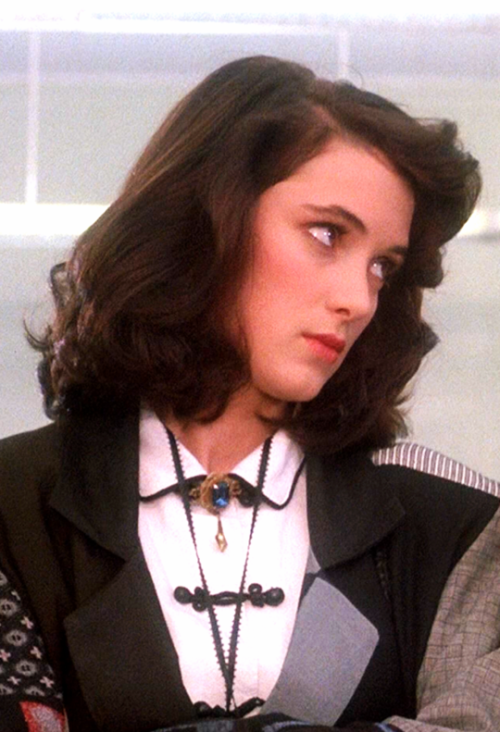 / Diamonds are a girl’s best friend.” Perfect. 22A. 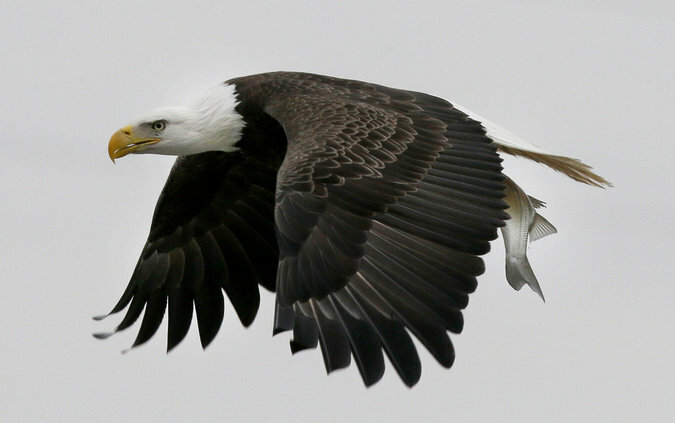 BALD EAGLES [Majestic fliers]. And now you can watch one being hatched! 37A. PRELUDE AND FUGUE [Two-part composition by J.S. Bach]. Now, really, is that beautiful fill or what? Wow. 60A. HARD-EARNED MONEY [Compensation achieved through great effort]. ‘Nuff said. An exemplary theme-set with nary a weak link. Gotta love that. And (in addition to those PEAR TREES) here’re some more highlights from the grid: OCEANAUTS—stationed, perhaps, in or around PENSACOLA—and “I SEE IT NOW!” All nines, too. So, as you see, in addition to the dense theme fill (68 letters in all), we get some nice, longer fill as well. 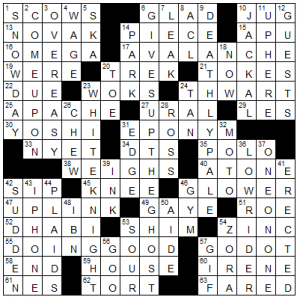 But we’re talking about a total of nine entries in a 76-word puzzle, in which the remainder is shared among threes (21), fours (20) and fives (26). VODKA [Appletini ingredient], GEHRY [Architect of the Guggenheim (Bilbao)], SEGUE and the ANGLE/ANGEL pairing notwithstanding, there’s not a lot of sparkle from where I sit, with the blame falling on the constraints of theme density. 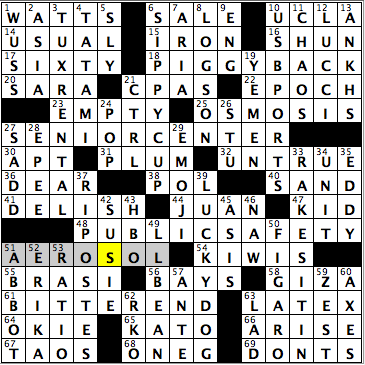 Then, in conjunction with the quantity of this less-than-desirable fill, once again I feel the puzzle’s energy was sapped by the sheer number of names (and awkward part-names or appearance of names…) in the mix: KERNS, ALI/ARI, SALMA, ENOS, ROPER, CEE-LO, GHERY, (Norma) RAE/MAE, Vittorio De SICA, STU and ADA… Clues like the metaphorical [Beach blanket?] for SAND, and the image-making (appetite-whetting) [Drench a doughnut] for DUNK definitely improved the picture. But not enough to lift me out of my doldrums. But ya know what? That’s life—and “tomorrow is another day,” and all that. 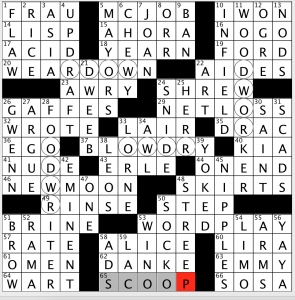 On the whole, I feel that this puzzle’s reach exceeds its grasp, ultimately missing the mark. Still, I’ll keep solving and encourage you to do the same. Come back again next week and let’s see what we’ve got! This puzzle is terrible! I mean, really! Who wrote this shite?! Oh. Hello folks! Self-blogging my own puzzle today. I hope you’re ready to take a little trip with me as we cruise on down the boulevard. Our theme is revealed at 38d: [Cars close to the ground, and a hint to the ends of the starred answers]. The answer of course is LOW RIDERS. Let’s look at the starred answers. 7d [*Checks out, so to speak] GIVES UP THE GHOST. 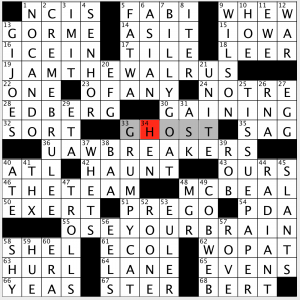 Original clue was [Joins the choir invisible]. So what’s the connection? 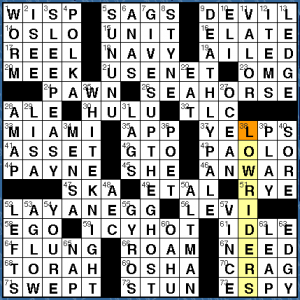 The last word of each answer can precede the word RIDER. They are at the ends of their respective answers, ergo, they are LOW RIDERS. Ha ha ha, tee hee, hoo boy! I slay me! Each rider is a fictional rider, respectively from film, TV, comics, and film (annoying inconsistency, grr!). And each rider rides a, um…a thing, respectively a motorcycle, talking car, motorcycle (annoying inconsistency, grr! ), and horse. I had fun coming up with this set, especially with all the great pop culture references. One other RIDER didn’t make the puzzle because it would’ve been an obvious outlier. That would be ROUGH RIDER. Pretty good non-theme fill. Not a lot, but I like USENET, SEAHORSE, LAY AN EGG, and ICY HOT. Not too much crud, but that north section was difficult to arrange. Had to put up with SUNUNU and ANAS and STYNE. Oh, and AEC at 48d. Blech! I had another version of this puzzle which I actually preferred. The revealer was the singular LOW RIDER and it was going to be titled “War Song”. That grid had a lot more fun non-theme fill like AVALANCHE, DOING GOOD, SNOW DAY, COME UPON, and ONE-ON-ONE. But Mike liked the plural version, and well, he’s the boss. So I hope you enjoyed the puzzle. Very often when I’m making a puzzle, I get a song stuck in my head and it becomes my own theme song for the puzzle, regardless of whether its related to the puzzle’s theme. This time, the puzzle’s song is obvious. I hope you give a listen if you haven’t heard it in a while. Until tomorrow! Good morning, everyone! I hope you’re doing very well today on the second day of spring! Today’s crossword puzzle, brought to us by Mr. Jeff Chen, takes common phrases and turns them into puns with the clues, as the second word in each theme entry is also a player/position in the game of football. How about the couple of references to soap operas in today’s grid, with both LUCCI (12D: [“All My Children” star]) and ERIKA making their presence felt (52D: [Slezak of “One Life to Live”]). Of course, Lucci’s character in her soap was a woman named Erica. Can’t say that I’ve watched a whole episode of OLTL, but definitely have done so with All My Children, Young and the Restless, Bold and the Beautiful and General Hospital. (Umm, did I just admit that?!? Yikes!) Loved seeing RIPOSTES, as that reminds me of different English soccer commentators using that word when a team scores a goal almost immediately after they just allowed a goal (37D: [Zingers]). It’s as if that’s their go-to word when that happens. All of the other long fill was pretty good, especially LUCKY DOG (39D: [One whom fate shines upon]). Never had to worry about a TUX RENTAL, at least for a prom night, since I never went to my high school prom (3D: [Promgoer’s need, often]). Sad, huh?! Well, if someone is going to a formal event sometime soon and wouldn’t mind inviting me, let me know and I’ll hopefully have a second chance at a prom night that I didn’t have in high school! Just know that I’ll definitely be one of the best dancers at the event, trust me! “Sports will make you smarter” moment of the day: UCLA (10A: [Kareem’s NCAA team]) –Not only did Kareem Abdul-Jabbar (then Lew Alcindor) win three NCAA championships while at UCLA, he became the first player in college basketball history to win three Final Four Most Outstanding Player awards. Only one other college basketball player has matched that: the University of Connecticut’s Breanna Stewart, who has a chance to make that four Final Four Most Outstanding Player awards this year, as her Huskies are currently in the Sweet 16 of the 2016 NCAA Women’s Basketball Tournament. Do you see what is happening? As the theme “Completing the Circle” implies, we change in the first entry an I to a J, then in the second one a J to a U, and finally in the last one a U is morphed into a O, thus “completing the circle!” Maybe a little odd, but a nice theme nonetheless. It maybe struck me since I had to figure it out after solving; it wasn’t readily apparent, so a nice “a-ha” moment is always fun. 4.1 stars for this one. I didn’t notice the theme also because I am trying to solve rapidly. Stamford is coming up fast! I’m sure I will see many of you there, including our constructor Matt! A time just over 4 minutes is fine with me! Hopefully I am rounding into form! 5A [Retired auto racer Teo ___] FABI – I knew him because I have watched the Indy 500 for years. Maybe a tad obscure? Here’s hoping he has a son that will win several races! 24A [“The Hunchback of ___ Dame”] NOTRE – Boo! Go Blue! Touch loss to the Irish last Friday night! 28A [Stefan who won six Grand Slam singles titles] EDBERG – I got to see him play live in Indianapolis several years ago. He had a great topspin serve, which I tried to emulate. He was until very recently Roger Federer’s coach. 1D [“Out of the question”] NO CAN DO – Favorite of the puzzle! 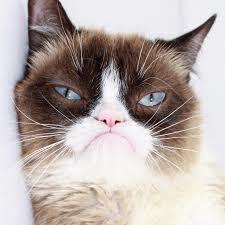 33D [Internet celebrity whose real name is Tardar Sauce] GRUMPY CAT – I had to look this cat up, and he does look grumpy! 41D [“Much appreciated,” in a text message] THX – I type this all the time! Is that bad? 48D [Ball club VIP] MGR – Short for manager, of course. I put MVP in at first! Great puzzle! Stamford is next week!! So the circled letters are all anagrams of the letters in WORD. I like it. And I like Ogden Nash wordplay, too! I remember I had to memorize a poem of his when I was in the second grade. It was The Hippopotamus. It’s only eight lines, but I couldn’t recite it today. You know who still can? Both of my parents! 5A [Flipping burgers, e.g.] MCJOB – My brother and my son had one of these, among other acquaintances! 29A [Bottom-line red ink] NET LOSS – My accounting classes are paying off! 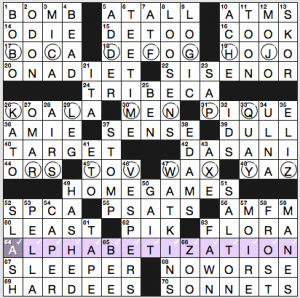 63A [One of seven for Julia Louis-Dreyfus] EMMY – A very recent Learned League answer! 65A [Ice cream helping] SCOOP – I just had some today! I’m not as prolific on posting pics on Facebook anymore; I need to get back into the groove! 10D [Shortstop’s realm] INFIELD – Major League Baseball starts the regular season on Sunday, April 3. Isn’t it nice how baseball starting means warm weather is on the way? 26D [“Miracle on 34th Street” actor Edmund] GWENN – I knew this name, even though I have astonishingly never seen this movie! But somehow I thought it was spelled GWYNN instead. 33D [“SNL” producer Michaels] LORNE – How long has this guy been around? And still producing quality material! Stamford is coming up soon! Hope to see many of you there! This entry was posted in Daily Puzzles and tagged C.C. Burnikel, Don Gagliardo, Ed Sessa, Elizabeth C. Gorski, Jeff Chen, Jim Peredo, Matt Jones, Zhouqin Burnikel. Bookmark the permalink. In the LAT, instead of “13 popes” for ‘Leos’ how about “Composer Janacek”? Hey Jim, thanks for the great puzzle! Pale Rider is one of my favorite westerns. For some reason, I always though the title referred to the Preacher, but looking at the Biblical reference, it is about the horse! Well, certainly “Rider” is referring to the Preacher, Clint Eastwood’s character, but yes, according to Wikipedia, it is the horse that is pale. From Revelations: “And I looked, and behold a pale horse: and his name that sat on him was Death, and Hell followed with him.” I guess they’re using “Pale” as a noun or as a name for the horse.